Daniel Penk – first Bornholm Runner under the 3 hours!! Browse: Home » DENMARK » Daniel Penk – first Bornholm Runner under the 3 hours!! It has been indicated a couple of times and on February 25th 2018 as far away as Tokyo it happen! Having in mind that he only arrived to Japan few days before the run it is really an amazing achievement and from the entire team of Bornholm Runners we would like to congratulate him in the „Below 3 hours Runners”. Daniel already has some new challenges for the 2018 which mean in September the Berlin Marathon is waiting. This marathon is well known to be one of the fastest in the World so perhaps we will see Daniel in yet another phantom time? 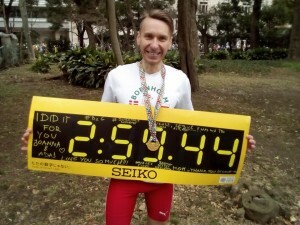 On February 25th also our Danish member Mark Hovesen ran a marathon. This time is was the Thy Trail Marathon in Jutland, Denmark. The route was partly in sand and hilly areas and for sure one of the most challenging Marathon Trails in Denmark. With a time of 4 hours 13 minutes and 5 secs. it is a great time for Mark who by this finished his only second marathon. no doubts that we can expect also some fast runs from his side in the future.